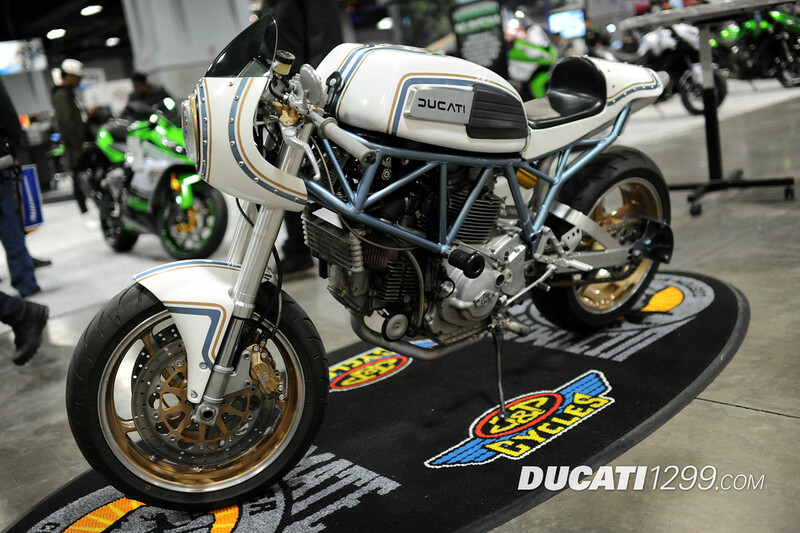 I spotted this 2002 Ducati Supersport as one of the rider entries at the International Motorcycle Show. 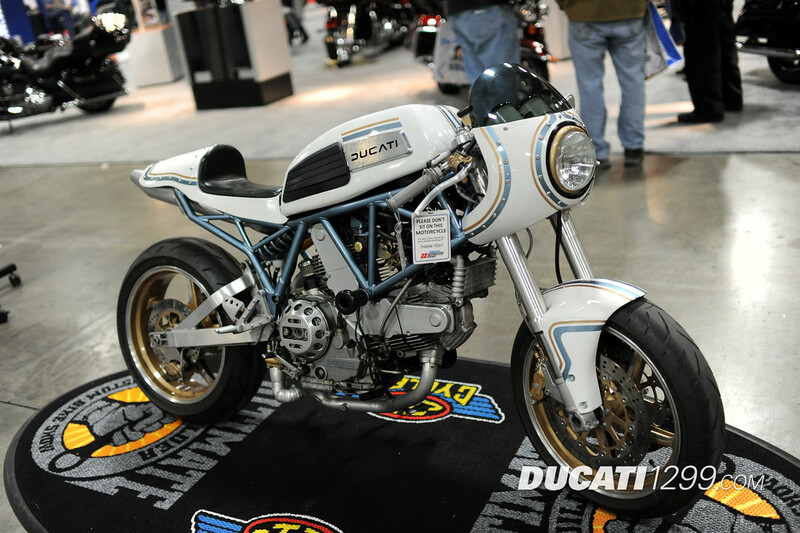 This is a 2002 Ducati Supersport with a Ducati 900cc engine bored out to 944cc and a modified rear subframe. 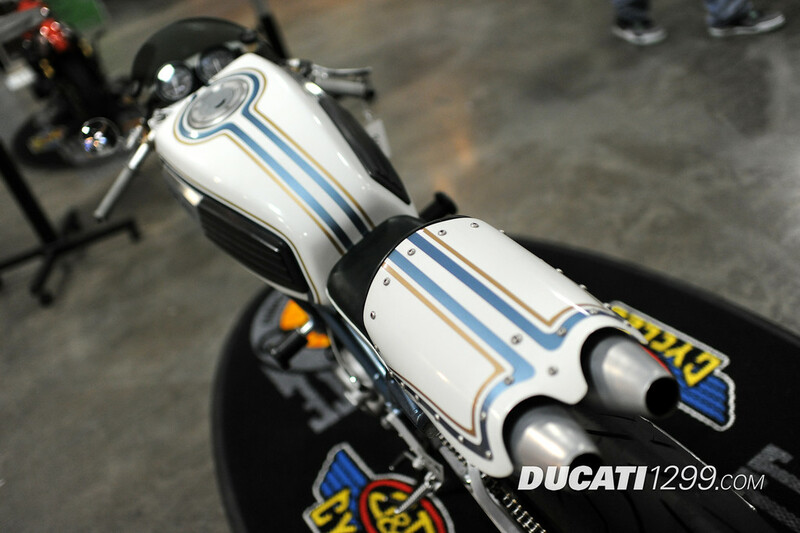 This motorcycle's name is "Daisy Duc" and was built by Chuck Koshiol and Jake Smith. The owner is Joao Santa-Rita. 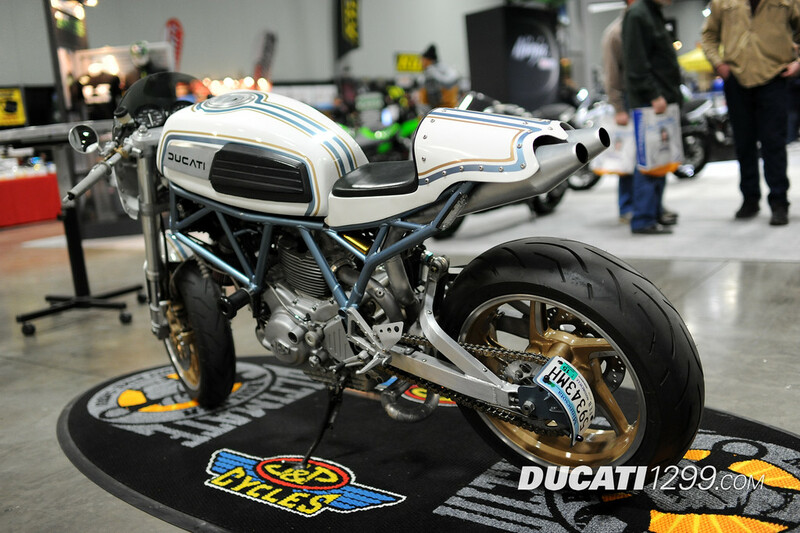 Washington D.C. based attorney João Santa-Rita’s quest for his dream Ducati has been years in the making. João, now 28, first started riding when he was 19 on a 1982 Suzuki 450 as a cheap and easy way to get around while he was in college. Years later, after finishing law school, he had kindled a love affair with riding and he decided he needed something a little beyond a practical ride. 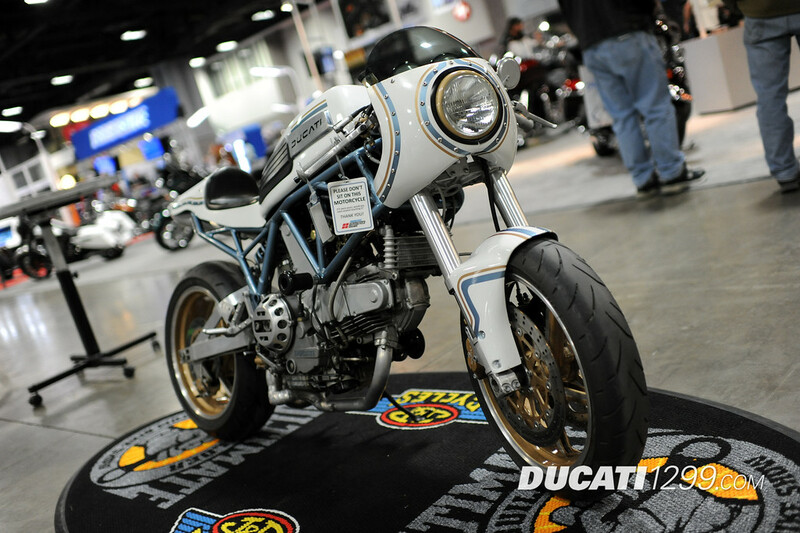 He bought a project 900 Ducati Super Sport from Florida. After some disappointing experiences with local shops that ended with a dangerous rear brake lock up, João and his three brothers, Julian, Saum, and Sina decided they would get the bike road worthy themselves. After long hours working together on it they had the customization and mechanics finished up and they were doing test rides and ironing out the bugs. That is when the bike was suddenly stolen. João and his brothers took to social media and blog posts offering reward money and even free beer for help leading to the bike’s recovery, but it was to no avail. Once again João began his quest. After searching online he came across Chuck Koshiol at Zap Leather and Cycle in Paynesville, MN. Chuck is quite the character who, at 67 years old refuses to slow down and can regularly be spotted flying down the back farm roads around Paynesville at speeds in the triple digits on his own supped up Ducati. Chuck put the shop together purely and simply to feed his own addiction to motorcycling. He has five guys in the shop each with their own area of expertise. 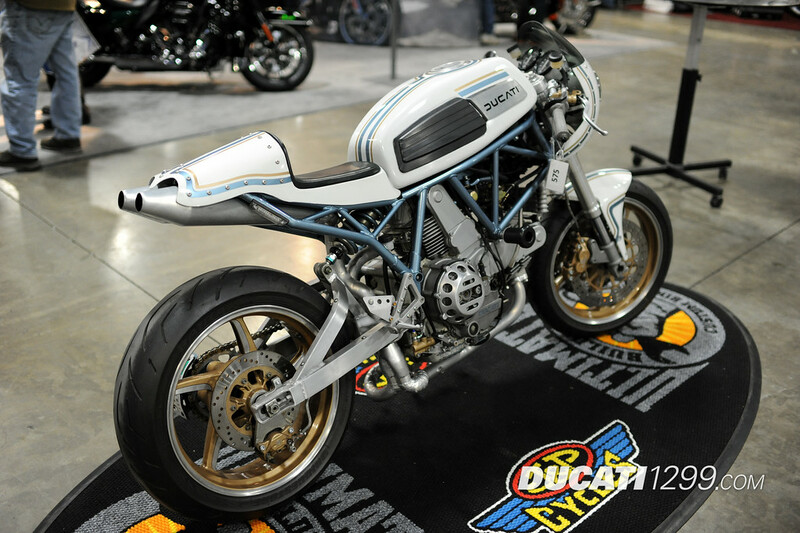 To keep his guys working through the tough Minnesota winters, Chuck has amassed a stockpile of project bikes; mostly European bikes and especially Ducati and vintage Norton. So when the snow starts to fall the guys each pick project bikes out of Chuck’s storage and build them for the shop to sell. When João first contacted Chuck about a bike in early 2014, Chuck’s lead fabricator, Jake Smith, had just begun work on a 2001 900ss. 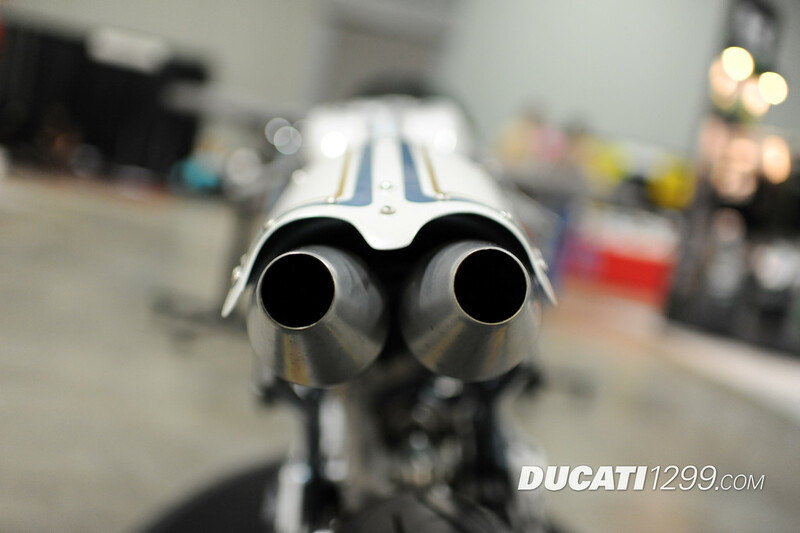 Jake had talked Chuck into letting him cut up a Trident tank off a 1969 Triumph T150 to fit the Ducati frame. 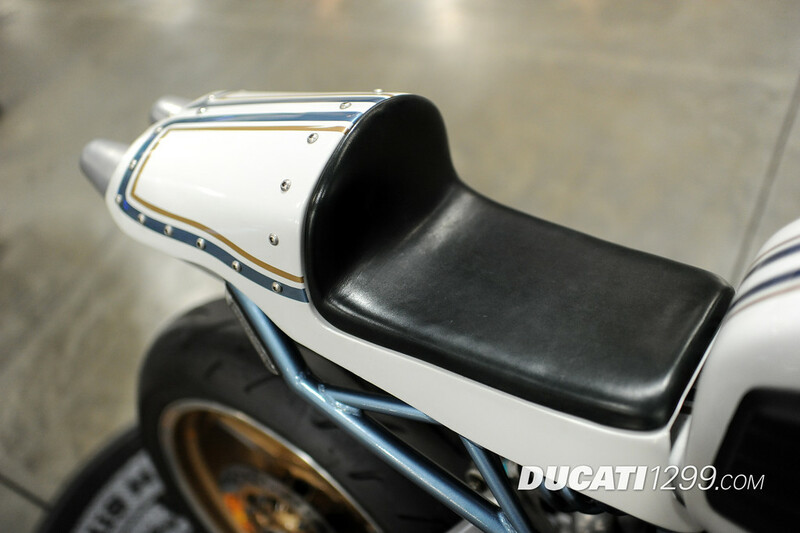 Jake also had a good start on the hand fabricated tail section and under-tail exhaust with vintage Norton Mufflers. João loved what he saw so far and signed on as the owner of the new project. From that point forward João collaborated with Chuck and Jake on the direction of the project. 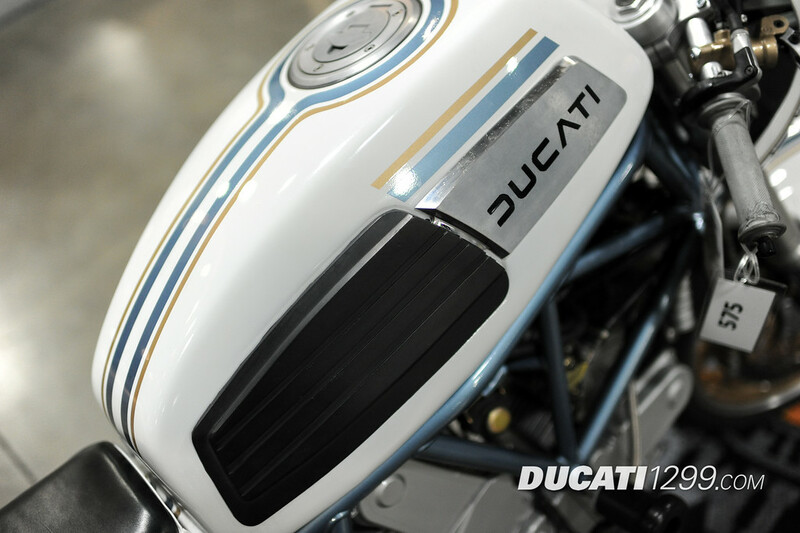 João’s older brother, Julian, happens to be a web designer and along with Julian’s wife they created the paint scheme digitally from photos of the mocked up project. His other brothers gladly contributed both welcome and unwelcomed advice on the project as well. 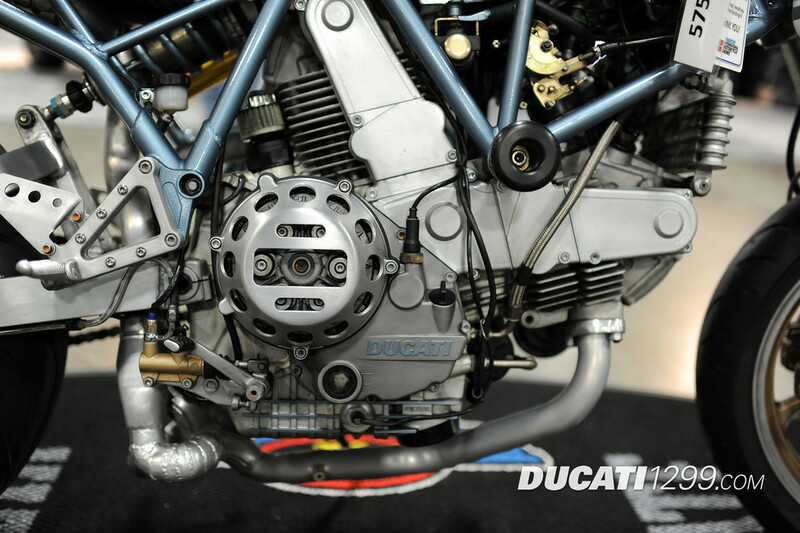 While Jake went to work on the finish welding and paint work, Zap’s in house Ducati expert, Evan Jones, tore apart the motor. Evan gave the top end the royal treatment. He started by sandblasting all the components to bring them down to raw aluminum. 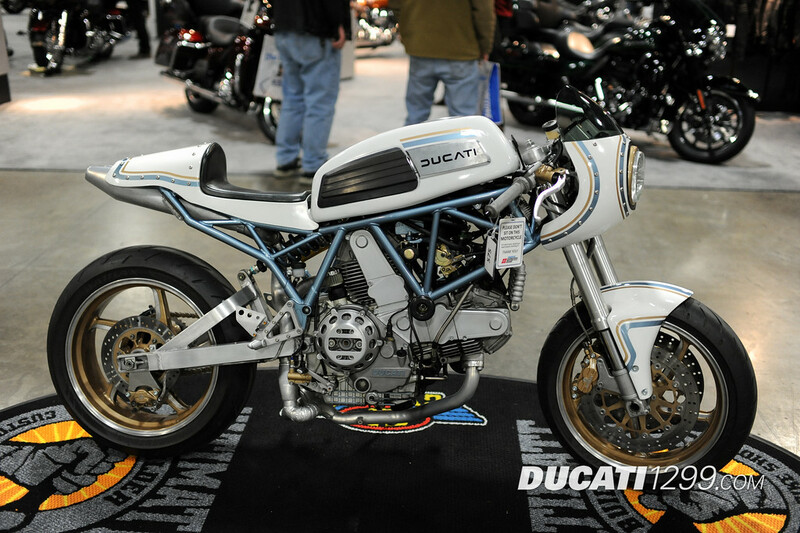 He had the cylinders sleeved and installed a set of Pistol Racing pistons that brought the Duc out to 944cc. Along with all new seals Evan installed a fresh set of belts and injectors. 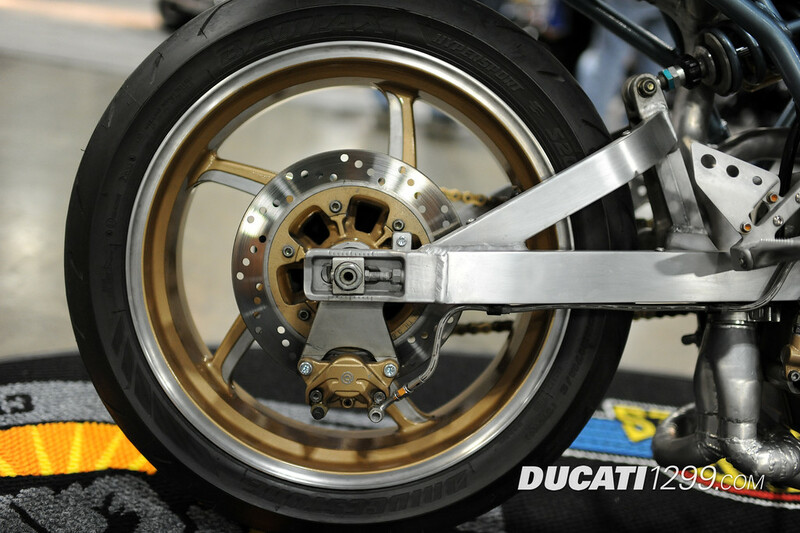 He recut the valves and seats and installed Advanced Valves and Valvetrain high-flow guides and seals. Evan then manually timed the valve cams to his special super-tune that advances the intake and retards the exhaust from factory settings. 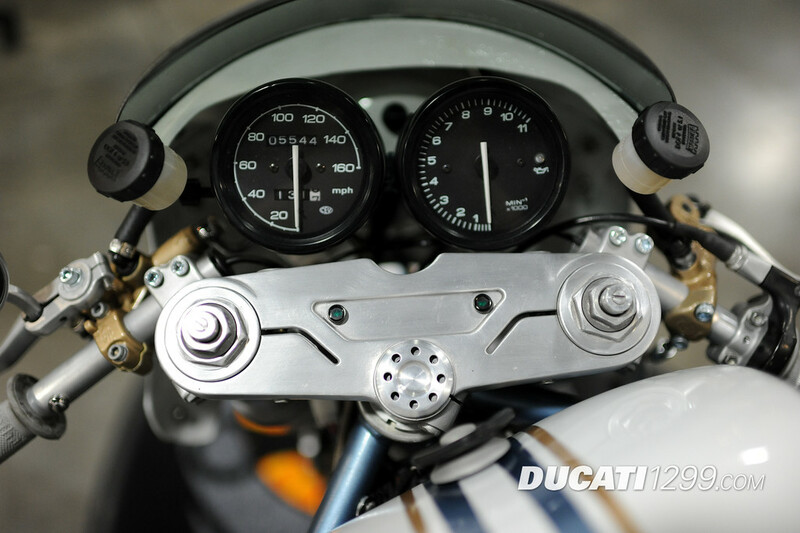 To finish off the tune-ability the engine electronics are conducted by a Power-Commander PC3. By the time Evan was finished hot-rodding the engine, Jake was finishing the paint and ready to take the project through final assembly and wiring. After getting the freshly painted chassis back on wheels and with a motor in it, Jake relocated virtually every electrical component to get the look as stealth as possible. 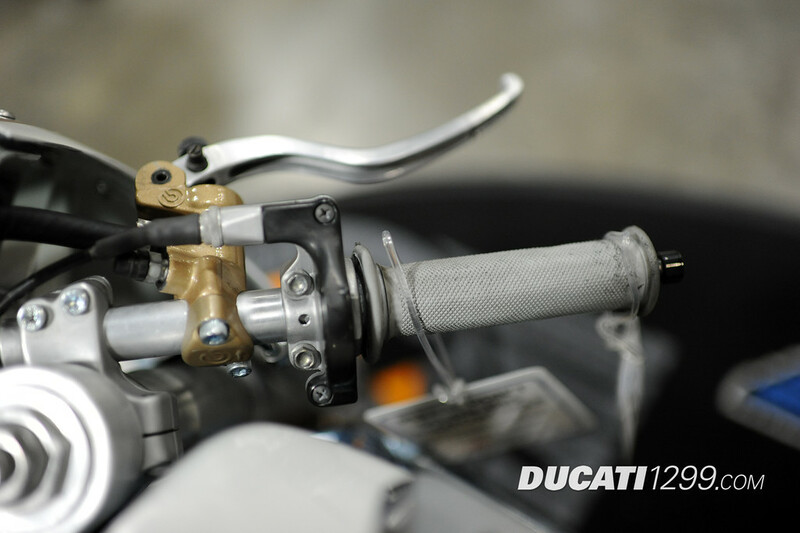 If you have ever taken a look at a modern Ducati wiring harness you know this is no small feat. 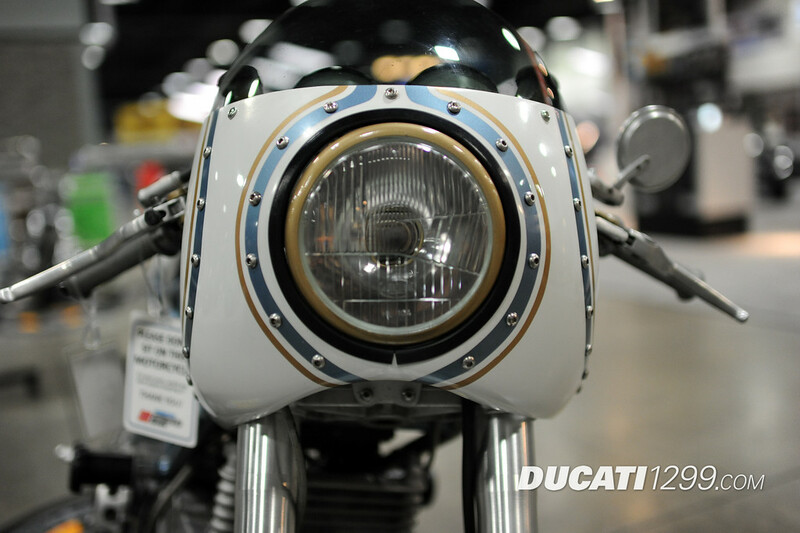 Jake also set up the duel rear brake lights to work as turn signals operated from bar-end push-button switches. After everyone at the shop had test-ridden it (just to make sure it was perfect, of course) Daisy was ready to be shipped off to her new home in D.C. João loves finally having his dream bike. He says, “I have always loved having things custom made, from the time I was a teenager and had my first custom made surfboard. 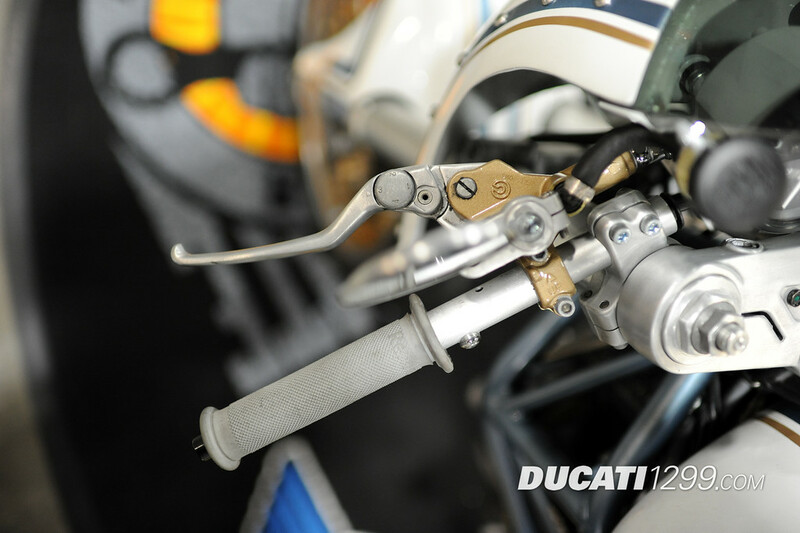 For me the love of motorcycling is half about the feel and the thrill of riding and half about having a fashion accessory that just looks cool.” Another thing João has to love about this bike is the price tag. Chuck’s unique business model and his crew’s ability to do a ridiculous amount of the work in-house made it possible for João to have his dream bike built for under $15,000. Zap Leather and Cycle would like to give a special thank you to Ryan James Unger for photographing Daisy Duc and to Adrienne Donnel for making the bike look even better.